Lay the cushions flat on the floor. Measure the overall depth with a tape measure and record the measurement. Most cushions are one piece with the seat and back hinged together. In order for us to make the seat the right depth and the back the right height, we need these measures. Make sure you know which part of the cushion is the seat and the back. Measure the seat depth by measuring from the front of the cushion to the hinge. Record seat depth. Measure the back starting from the top of the back to the hinge point. Record seat height. Measure the width of the cushion at the widest point. Measure thickness. Please note that older cushions made with fiber filler will have flattened over time and use. Most chairs and chaises that require cushions have approximately a 3" thickness for proper comfort. Double check your measurements as custom cushions made to your measurements cannot be returned. If you have questions, send us a email or fax. If you do not have cushions, then you will need to measure the frame. Measure from the front rail (bar or tube) of the seat to the back of the seat. Most cushions will extend a little over the front rail, therefore add approximately 1 inch to the measurement. Record the measure as seat depth. Measure from the top of the back to where the seat begins. Often there is not a defined location of where the back ends and the seat begins because the frame has a curve in the frame. If that’s the case, measure to the middle of the curve. Add approximately 1.5" to this measurement as most cushions extend above the top rail. This is especially important if the seat supports are made of vinyl strap that stretch. Record the measurement as back height. If you are measuring for wood furniture, you may not want the cushion to extend beyond the frame. Measure between the arms to obtain seat width. Record measurement. For thickness, most chairs that require cushions have approximately 3" thickness. If you can seat comfortably in a chair without cushions, then a 3" cushion will be too thick. Another determination is that if the cushion is supported by vinyl straps that are over 1 inch apart, then it is a good possibility that you need the thicker cushion. Double check your measurements as cushions made to your specifications are not returnable. If you have questions or require additional assistance, please send us a fax or e-mail. We have been manufacturing cushions for over 20 years and our knowledgeable customer service representatives will be happy to assist you. Remove the cushion from the furniture and place it on a flat surface to measure. Place the zippered side to the back, as if the cushion were sitting in the furniture frame. 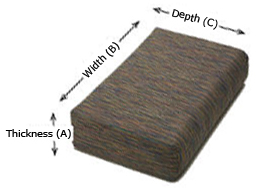 To measure depth (A): Depth is the space from the top of the cushion to the bottom. Place a ruler or flat cardboard on the cushion surface, slightly hanging over the edge and measure the distance between the top and bottom. 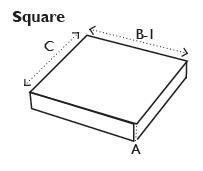 To measure width (B): Width is the space from one side of the cushion (as it rests in the furniture frame) to the other (i.e., from left to right). Use a tape measure, lay flat from one edge to the other. Place a ruler against the edge of the cushion, the measurement is where the tape measure meets the ruler. 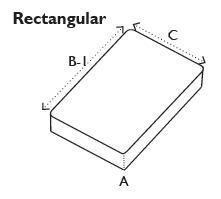 To measure depth (C): Depth is the space from the zippered side (as it rests in the furniture frame) to the front edge of the cushion (i.e., from back to front). Use a tape measure, lay flat from one edge to the other. Place a ruler against the edge of the cushion, the measurement is where the tape measure meets the ruler. 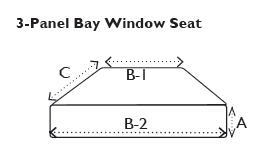 To measure window seat cushions: Lay the cushion flat on a large sheet of paper. Trace the cushion to form a template. Measure each dimension using the instructions above (including depth which will not be obvious on the template). Include exact sizes for each measurement on your template. Or if possible, please send a sample cushion to use as a template. Note: There is a 1/8" tolerance in cushion measurements. Measure from the top of the back to where the seat begins. Often there is not a defined location of where the back ends and the seat begins because the frame has a curve in the frame. If that's the case, measure to the middle of the curve. Add approximately 1.5" to this measurement as most cushions extend above the top rail. This is especially important if the seat supports are made of vinyl strap that stretch. Record the measurement as back height. If you are measuring for wood furniture, you may not want the cushion to extend beyond the frame. Sunbrella®, Comfort Sling®, Firesist®, and Glen Raven® are registered Trademarks of Glen Raven, Inc.
Smith & Hawken® is a registered trademark of Target Brands, Inc. Permission has been granted by Waverly® to display copyrighted designs. All rights reserved.